The theme at the Three Muses is FLAPPER. I'm depicting two gorgeous flapper dresses. The first one was designed by Adrian in 1929; the second one by Alberta Ferreti in 2009. Although 80 years separate them they have very much in common. We can't say the same about the model. The second one is as beautiful as the first but much more slender and tall. An almost impossible woman that the fashion industry transforms into an impossible dream to most girls all over the world. I did the background beginning from the first photo, then added textures by Parée. Lovely gowns but your background is fabulous...beautiful work. The background you chose for the models is inspired. It sets them off to perfection. Interesting to see the transformation to the ultra slim, almost emaciated model that we see still today. How I wish plump would come back!! What you have done with this is simply fascinating, Christine!! Bravo! 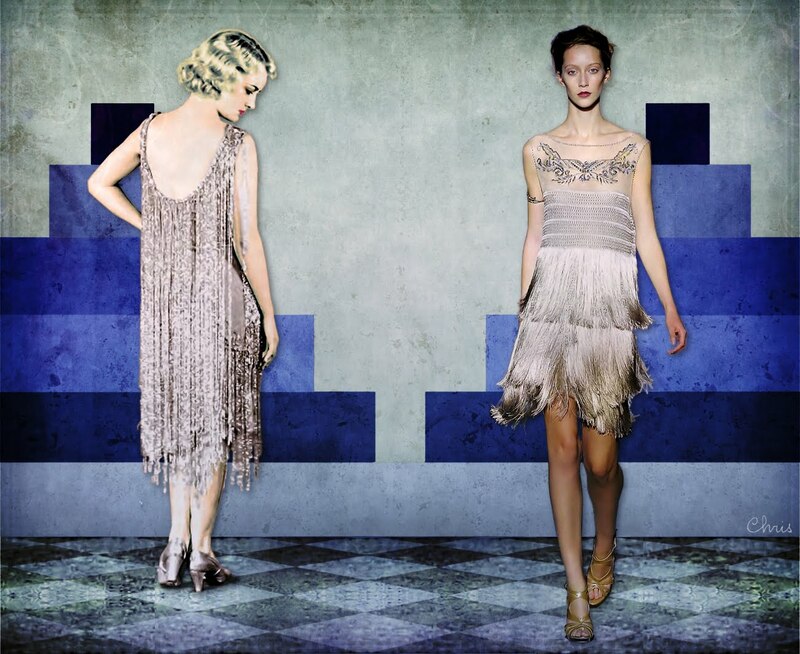 Great flapper dresses (old and new). Two elegant 1920'2 ladies against a beautiful background. This is gorgeous, Chris.